You’ve probably heard the maxim that many injuries occur in the home. While that may be true, it’s a sad fact that serious injuries can occur at any time and any place, and under unexpected circumstances. The White Plains accident attorneys at Worby Groner Edelman have years of experience representing accident victims injured under many different scenarios. One area of danger – and where one might not expect to be injured – is at an athletic event. Whether that event is professional, amateur, or even unorganized in nature, the law in New York can severely limit the liability of a facility owner or the participants for injuries suffered by an accident victim. New York recognizes a doctrine known as “Primary Assumption of Risk”. Under this doctrine, an owner’s obligation to reduce the risks of an activity is limited, and the law will deem you to have assumed certain risks known to be inherent in that particular athletic or recreational activity. You can be a voluntary participant, a spectator, or even a bystander, and you may not have a viable claim for injuries. The extent of one’s assumption of the risk and a potential defendant's responsibility will vary depending upon the victim’s capacity to appreciate the risks of an activity. Generally one is deemed to have assumed the commonly appreciated risks inherent in and that arise out of the nature of the sport. For example, front row seats at a high school basketball game are great, but an errant pass might result in you being hit by the ball; spectators have even been struck by a charging player unable to control her momentum. 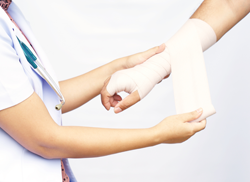 In either case, the law might well prevent you from suing for your injuries. Many people enjoy ice skating and skiing at this time of year, but a rink or ski area owner is not obligated to guarantee your safety. A crack in the ice or a gap in the snow will probably not render the owner responsible for a resulting injury. Even someone who bumps in to you causing you to fall will probably be able to avoid liability for your injury. A ski facility’s mislabeling a particular trail, on the other hand, is a likely exception to an assumption of risk defense, since there was affirmative misrepresentation on the part of the facility. A participant or spectator will be deemed to have assumed a risk attributable to an open and obvious condition of the place where the sporting or recreational activity occurs. The more open and obvious the risk and the more the consequent risks are readily appreciable, the more limited an owner’s responsibility to you. Exceptions to this rule do exist. If the particular facts indicate that the person who caused your accident acted in a reckless manner, you might be able to avoid the harshness of this rule. Be careful to avoid situations where people are skating in the wrong direction, or speed skating on a crowded rink. If you bring such a situation to the attention of an attendant, there is more of a chance to avoid an assumption of risk defense. As in all cases, the precise factual scenario will control, so it is important for you to remember and inform your legal representative as much about the accident as you can remember. As always, use basic common sense. If something looks dangerous, avoid it. Try and be aware of your surroundings, and of the state of any athletic facility that you visit. Contact the White Plains accident attorneys at Worby Groner Edelman if you are involved in a sports related or recreational accident, or any type of accident for a free, no obligation consultation. We will answer your questions, and analyze the precise facts to determine whether you have a case. We’ll give you our honest opinion on the merits of you case, and answer all of your questions. The attorneys at Worby Groner Edelman will treat you with the respect that you deserve. There is never a fee unless we are successful.